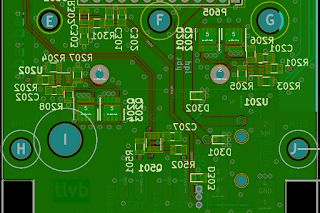 I'm not sure there's a lot to say about the schematics for this device, a lot of it is based on the Chip Pro dev-kit, which I did a proof-of-concept system with, before making the schematic and the pcb design. The main thing I did there, was to connect the microphone pin of the trrs jack to the lradc input of the Chip Pro which allows me to detect keypresses on android-compatible headsets. If you didn't know this already, there is a standardized way of wiring these buttons up which can then be detected by a low-resolution and slow ADC. That's it for the audio side. In the final design there's a lot of features that have been cut however, in order to cut costs as well as allowing the use of a smaller enclosure. The initial design had a max3221e 3.3V-uart-to-rs232 level converter with esd protection, as well as an external 5-pin DIN connector. 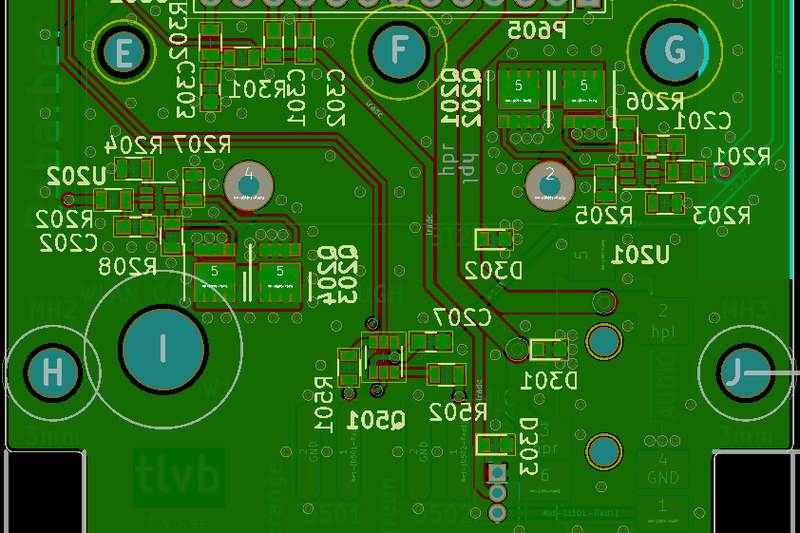 Five pins because that would allow me to have +5V for charging, as well as automatically powering the device on for configuration, and of course the RX+TX+GND for the serial communication. The din connectors that were rated for enough amperage to charge however weren't exactly cheap, and using them not only for configuration, but charging as well, meant that I would need to buy one similarly expensive plug for each device I would want to charge in parallel as well. The jack is somewhat bulky too and needs a quite large drill diameter. So I revised the design, moving the charging to a standard barrel jack, and the serial io and remote power-on to a second trrs jack. Further revisions of the hardware removed the external serial jack entirely, which means one hole less to get lined up and drill, less things to fit in the enclosure, and lower component cost. As for serial configuration being more difficult, my thoughts along the line that it should either be possible to do over wifi, e.g. by attempting to connect to a known network just after boot, or in the event of the actual need for serial configuration and troubleshooting, it will probably be in use cases where somebody knowledgeable enough about the device is needed, that opening the box and plugging in a few wire headers will not be a big problem. I put some esd protection diodes on the port however just to be safe. Another thing that changed through the revisions are the battery protection circuitry. The Chip Pro has circuitry for charging lithium based rechargeables on-board, so I decided to power it all by two 18650 cells in parallel. This is not entirely without risk, and over-current protection (and ideally under-voltage protection as well) is needed. 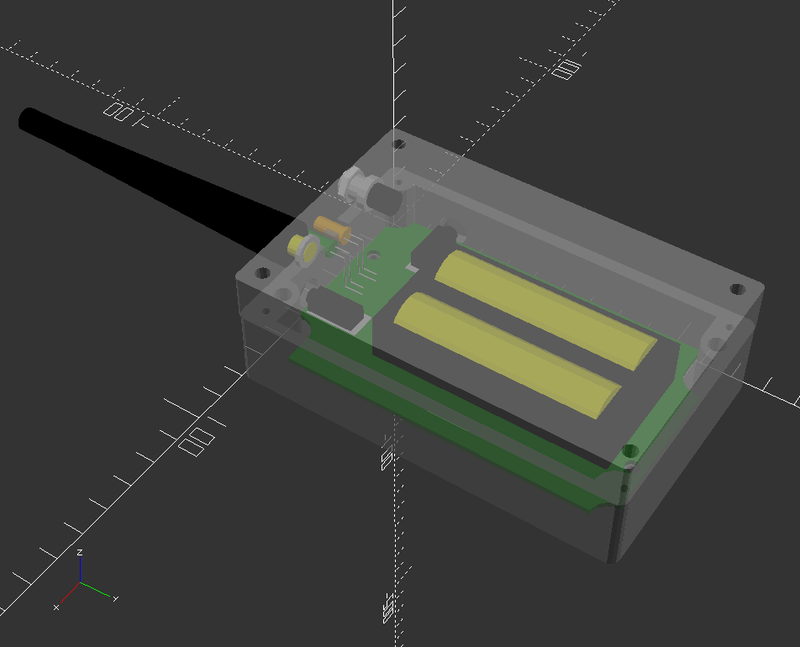 Looking up battery protection methods I found the I found the bq297xx and started to add the reference design from the datasheet to my schematic. After a while I realized that there's probably no way I'm going to be able to hand-solder this, not with my current iron at least, and went through design iterations with glass fuses as well as polyfuses, before returning to the bq297xx based design and buying a cheap hot-air station on ebay. Combine this with the battery holder being mounted on the other side of the board, across the rectangular hole, so that the positive and negative pins end up on opposite sides, and that the battery protection circuitry need to be connected to both battery poles, and you will end up having to give some thought to how you're going to layout the power distribution nets. I seriously considered running air-wires for a while, but in the end I think I managed to come up with something that should work. Board detail, bottom side, mirrored; the four component clusters are: battery protection to the left and right (one group for each battery), close to the bottom is the transistor switch for the status leds, as well as three esd diodes, and the topmost group is powering and filtering of the microphone input. The width of the board is 50mm. The 3D render of the board (top side shown) shows just how much space is consumed by the battery holder (BT201, big silkscreen rectangle) and the hole needed to mount the Chip Pro. You can also just barely make out the wide power trace forming a something like a backwards Ç or F around the hole (the tail being hidden below the silkscreen rectangle), going from the top pins of the battery holder, down to the protection circuitry on the other side, with a set of three vias on the right branching off to supply power to the SBC. I have used kicad to draw the schematic and route the board, and while it in general has been a pleasant experience I would wish that it would be possible to have multiple custom grids and grid origins, without having to reenter them each time. I should probably place a caveat on the "pleasant experience", but dealing with trying to align components and traces where measurements are alternating between mil and mm, sometimes in the same component, is a pain. 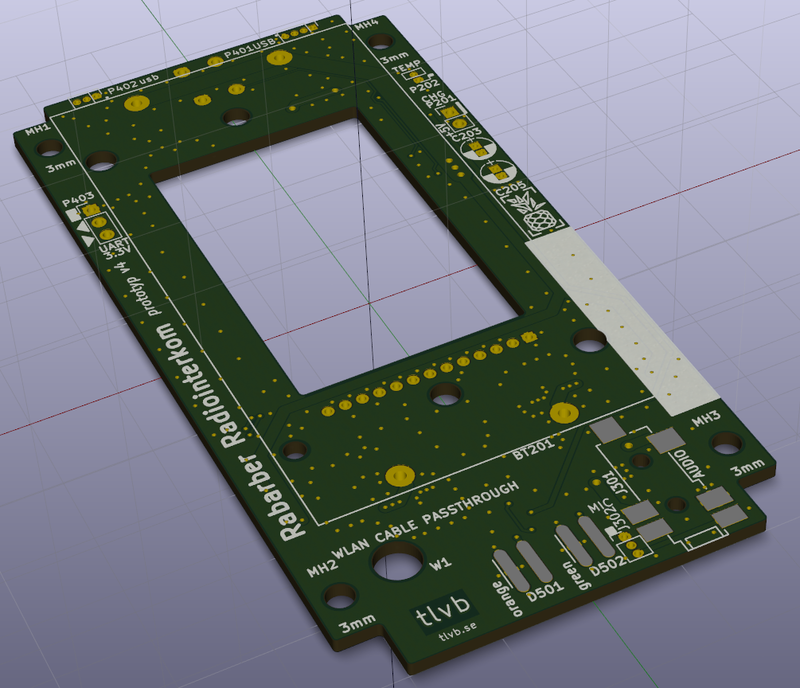 This is no fault of kicad however, but simply the nature of the thing. After ordering components, but before ordering the actual pcb, I cut a piece of paper to the dimensions of the pcb and placed it in the enclosure to ensure that things would fit. They did, snugly, and with pretty much no margin, but they fit. When I arrived at the initial bill-of-materials I was somewhat disheartened. As anyone with this hobby knows, electronics development is not cheap. Building something that I'm going to be putting in the hands of someone else leaves no room for compromise regarding e.g. enclosure choice, and counting units in the singular digits places you pretty far from the economy of numbers. And that's fine, hobbies are meant for enjoyment and possibly learning, but I'm not really comfortable with asking the group to foot the bill for five or ten units. Not when this is a one-of-a-kind solution with a bus factor of one as well as the need for a server to bounce against, and not when you can get COTS radios (removing the server need and bus factor) with higher audio quality than what we are currently using for the same money as investing in this project. Still, I have dived far too deep into this project to not see at least one trial unit brought to completion, just to see if it will work. And if it does, and if I can get Next Thing Co to sell me additional Chip Pro units, I'll build a few more, to see if, or rather how well they will talk to each other. And then we will have enough units to evaluate functionality in the intended use-case. I decided to try to not entirely roll my own infrastructure, but to implement an already existing VoIP protocol, since this would give me the benefit of not having to build the server-side of the system, as well as being compatible with already existing clients. There are smartphone clients for the Mumble protocol that we did try out, but the one for iPhone would not work properly (I know nothing about iPhones so I can't really bring more light on the situation), and I myself found my android smartphone wholly unsuitable for the kind of push-to-talk-like use-case that we had. So while using smartphones did not work out, it gave me a protocol; the mumble protocol is open, and so are many of the clients. Or to be entirely honest, the availability of the mumble protocol, clients, and servers, is pretty much the reason I advocated that it might be worth trying to replace our PMR radio system with smartphones running said clients in the first place. The failure of this trial is perhaps what started glimpses of custom purpose-built hardware to appear in my mind. So, I started on the software side by trying to implement a mumble client. Starting on the hardware side would have been a bad move, since it would mean having to invest not only time but also money, before I knew if I could a system running even on a regular computer. I had never before used OpenSSL from pure C, only in Perl, where most of it is hidden away. Getting audio I/O running, and running smoothly, with Alsa, proved to be a quite difficult task as well. I have a few sentences of unpublished blog draft from when the software was much younger, which is aptly titled "Death by a thousand small errors", the tone is something like "Do X he thought. It will be fun he thought. Also do Y and Z because why stop at X." Continuing putting effort into the software paid off though, and while not a full implementation of the mumble protocol, in fact it's fairly minimal, it works pretty well. There is a repository available at https://github.com/tlvb/rabarber. It should be said that the software went through a few incomplete revisions, both when it comes to whether C or C++ would be the best suited for the task, and what would be a good architecture to implement. Queues of packets that are generated and consumed and have different subtypes and so on is where C++ with templates and inheritance could come to shine, but if entirely honest, I'm more of a C person at heart. I still got my generics by way of preprocessor macros, and while that may have some avert their eyes so as not to become tainted themselves, I am as happy as a pig in mud and claim it has a certain, hm, rustic charm. I'm also a champion of the notion that bad software design is not the fault of the language but of the programmer, so most of the code rewrites was not due to me waffling on the language choice, but because I was still figuring out a sensible architecture for the thing, something I find is one if not the hardest things to tackle when approaching a new design. 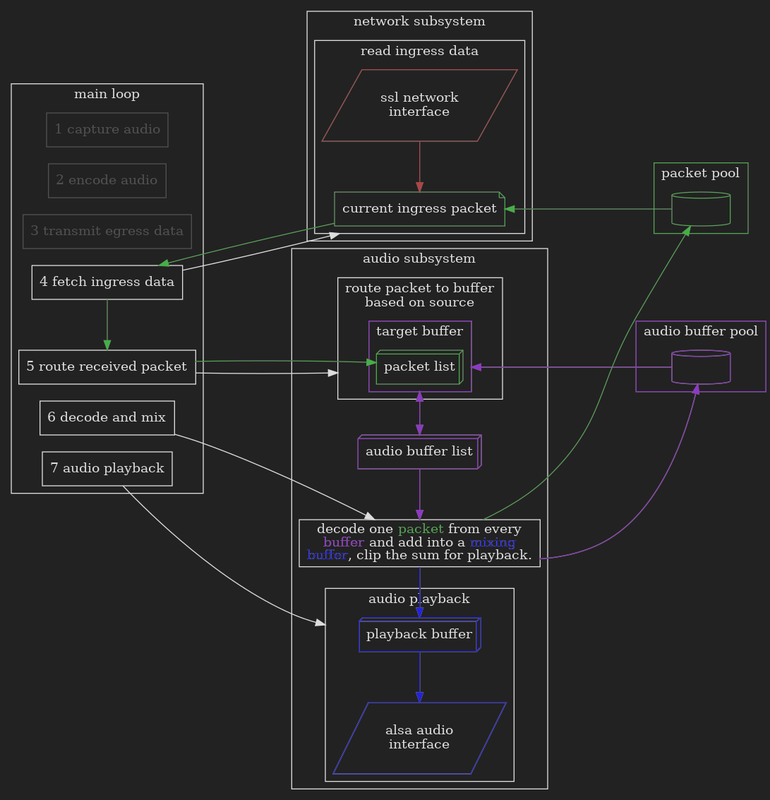 In the end I have gone for a single-threaded non-blocking I/O setup, where the various subsystems (mainly network and audio, which can be further split into read and write operations) communicate through adding and removing nodes to linked lists. 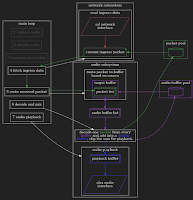 I keep memory allocation and deallocation during run-time as low as possible by getting and returning the nodes from and to memory pools and allocate only when the pool dries out. Freeing memory is done at program termination. 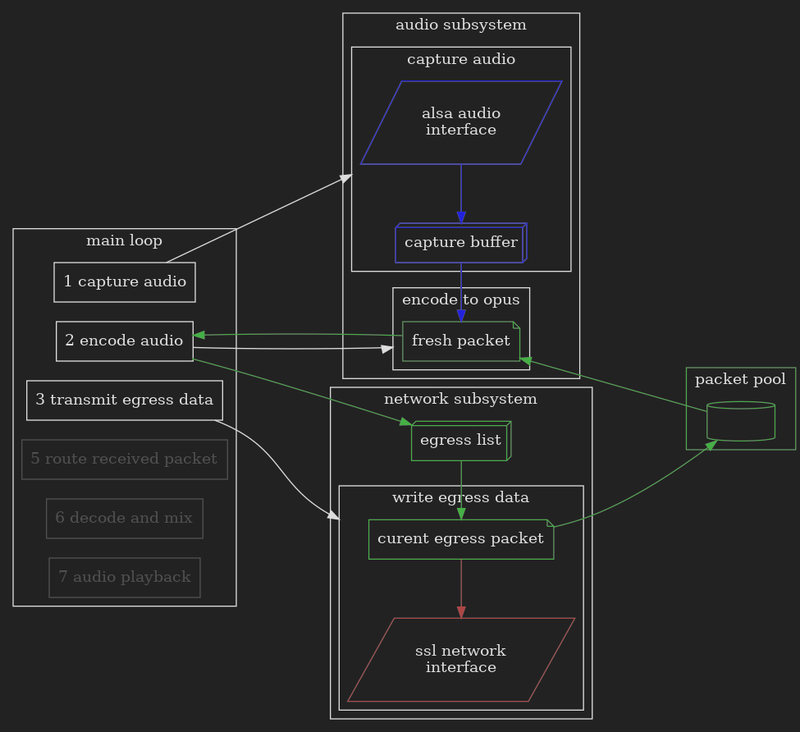 Approximate dataflow for capturing audio and sending it to the server. 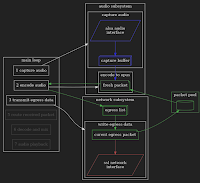 Approximate dataflow for receiving audio from the server and playing it. It is more complex than capture, since we may recieve audio from multiple speakers at the same time, and we have to keep separate audio buffers for these. When we put up a show, we usually have communications line set up between the technician group at the mixing station, the band, backstage, and usually the producer as well. For years this has been done with inexpensive PMR446 handheld radios combined with headsets. (You can't put the speaker on during the show or you'll annoy the audience with beeps and squelch tails.) It is a well known fact by now though that the intelligibility of somebody trying to whisper through these radios in a noisy environment, is slightly less than ideal, and perhaps 50% of the transmissions are variations on the theme "repeat please", "come again", and so on. I once had the misfortune of being wired into a professional system, and since then I were aware of how good it could be. On the other hand, professional grade systems are for professional grade budget outfits, and that's pretty much the end of the story. Unless I was bitten. And that's how it starts. It's usually how it starts. At least the order of operations have been somewhat sensible so far. A number of SBCs were considered, somewhat unsurprisingly, the Raspberry Pi Zero W was one, another was the C.H.I.P Pro. Other evaluated options were less known fruit themed boards that have popped up in the wake of the success of the Raspberry Pi brand, such as the Orange Pi. After reading reports of unreliability of the wifi subsystem of many of the pi clones I pretty much wrote them off. In the end the Chip won over the Pi, since it for my particular use case comes preloaded with a lot of things that I would otherwise have to supply hardware for myself, such as audio codec and battery management systems. The Chip comes with flash storage as well, compared to the Pi's need for a µSD-card. 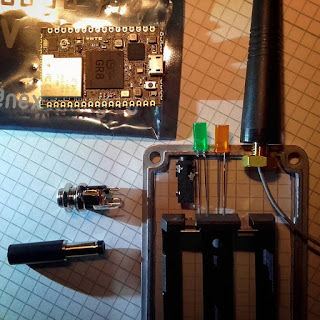 Another upside of the Chip is that it has a u.fl.-compatible connector for an external wifi antenna, which is needed since I plan to use a metal enclosure. Both systems have the downside that it's not exactly easy to just buy five of them, the Pi you can only buy one at a time, and the to buy the Chip, standalone from the development kit, you have to talk to sales. I don't want to talk to sales, they have pretty much sold me on the product with the feature set alone. A trial placement of the bulkiest components and the enclosure, in order to verify that they would fit inside the box. Since then, the project has been stripped of a few non-essential features, and fit into a slightly smaller enclosure. In both cases, the C.H.I.P Pro would be mounted on the other side of the board, underneath the battery holder.